The Project is not connected to the electricity grid. Instead, energy needs are met through two systems – one a mixture of pico-hydro and solar, and the other wind and solar. In both cases, the systems supply 220 volts to the buildings. A solar panel provides hot water for the main house. The water for the pico-turbine is captured from a small stream and transported via pipe about 800 meters to a small tank. It is then dropped about 70 meters through pressure pipe to the turbine. The water is then returned to the stream. - No use of dams hydropower - kills lots of fish and other freshwater creatures and plants. Transmission lines are deadly for birds and bats. - No use of high or large wind turbines - kill millions of birds and bats every year. 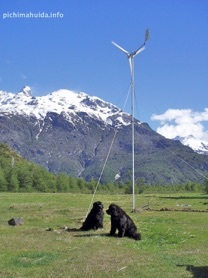 Animals and birds avoid sites disturbed by wind turbines, there are average 50% less wildlife in disturbed sites. “Sustainable” solutions are quite often not Nature-friendly. Independent small sources are not subject to effects in cascades.